600 people reached the top of Mt. Everest in 2012. 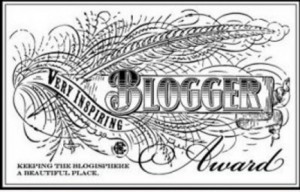 This blog got about 7,500 views in 2012. If every person who reached the top of Mt. Everest viewed this blog, it would have taken 13 years to get that many views. Living in a place where it can snow 9 months out of the year (so far, I have seen snow in ever month except June, July, and August) that worships being outdoors when the rest of the country is saying that it’s just too freaking cold, I drink a lot of hot cocoa. But the really, really good stuff is loaded with milk and cream, and the packets don’t really fit well into that whole cleaning thing. While I’m far from ever going full vegan, I do try to limit my dairy, especially milk. So here’s my favorite non-dairy hot cocoa. It’s so rich and creamy that you’ll never know that it’s vegan friendly as well. 1. Mix sugar, cocoa, salt and water in saucepan over medium heat. Stir well and bring to an easy boil while stirring continuously. Simmer for about 2 minutes making sure it doesn’t scorch. 2. Add almond milk and heat until hot, but not boiling. Remove heat and add vanilla. Divide between 4 mugs and enjoy! Over the past few months, I’ve participated in the foodie pen pal program through the Lean Green Bean. This month, instead of spending money to buy food items to send to our pen pals, she has asked that we donate that money to Hurricane Sandy relief. If you’d like to get involved, click on the button below. 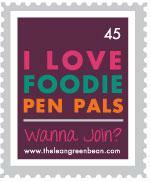 The past few months, I’ve been participating in the Foodie Pen Pal program organized by Lindsay at the Lean Green Bean. After a few months of ending up empty-handed, I was really excited to come home one day and find a package from Sarah full of goodies from her home state of Colorado. I had a great time unpacking the box to discover all the goodies she’d sent me. In the box, I found a bag of Archer Farms Pecan Sticky Bun Granola from Target, Korma Curry Powder, Corn Chips with flax-seed from one of the local health food stores, almond butter, Celestial Seasonings Fruit Tea Sampler, a peach Greek yogurt granola bar, Ghirardelli hot cocoa and peppermint stir sticks, white chocolate chai, a seasoning packet, and some homemade spiced nuts (eaten before I could snap a pic). The granola, hot cocoa, curry and almond butter are some of her favorite things that she wanted to share. The spice mix is from a spice shop one of her coworkers owns (and really good on potatoes!!!). The stirrers are made in Denver. They went so good with the hot cocoa mix!! The chai was from her favorite chai place. It was the perfect treat one chilly night while sitting by the fireplace. The tea is made in Boulder. I love Celestial Seasonings tea!! I always throw a bag or two in my med kit for nights I have to work hockey and need something hot to drink. The fruit sampler is one of my favorites. I haven’t had a chance to try the curry yet, but everything else was so yummy. Most of the box has disappeared already. Thanks Sarah for all the wonderful treats!! This month I sent my package to Lyndi at The Journey. Click here to see what all I sent her way. If you’re interested in being a foodie pen pal, click on the link on my homepage. 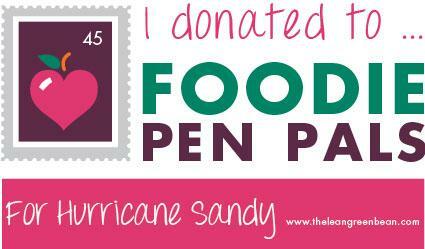 Instead of sending food gifts to each other this month, Lindsay is asking the pen pals to donate the money they would normally spend on their food gifts to those affected by Hurricane Sandy. If you’d like to donate, click here for more information. Well my biggest goal for December is not to fail as miserably on my goals as I did the last month. So in no particular order, here are my goals for December. 1. Become an ultra-marathoner – One of my friends somehow talked me into running the Huff 50k with her at the end of December. A few years ago, if you told me I was going to try running an ultra someday, I would have laughed in your face. But the whole, “It’s only 5 miles longer than a marathon,” argument won out. Well, that and homemade turtle candies at the aid stations. As a little extra incentive, I ordered this shirt from INKnBURN as a gift to myself when I finish. 2. Get a Christmas Tree up this year… before Christmas – We didn’t have a tree last year. Or any decorations to really speak of. I didn’t even send out Christmas cards. I was a complete Scrooge. Normally, I love the holidays. But that whole separating from my ex and asking for a divorce a few weeks before Christmas really put a damper on things. The only thing that’s been in my way this year as for getting into the Christmas spirit is the 50 degree temps we’re having in December. Not that I mind, but it makes it hard to think about Christmas in a state where white Christmases are the norm. 3. Eat clean between now and Christmas – I know that eating well over Christmas will be pretty much a wash, but that doesn’t mean I can’t behave the rest of the month. Watch for some holiday inspired recipe makeovers. I’m a huge fan of holiday baking. It’s something that my daughter and I have done together since she was able to work a spoon. We’ll be keeping our cookie tradition going again this year. What are your goals to finish off 2012 strong?